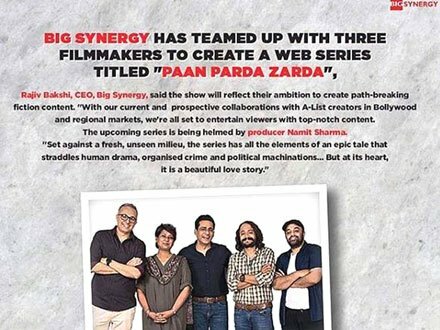 Reliance Entertainment’s Big Synergy has teamed up with three filmmakers to create a web series titled Paan Parda Zarda, described as an intoxicating love story set amidst the opium trade barons of central India. Walkie Talkies is the joint venture of three successful filmmakers — Mrighdeep Lamba (Fukrey and Fukrey Returns), Gurmeet Singh (Mirzapur and Inside Edge), and Shilpi Dasgupta (yet-untitled under-production film with Sonakshi Sinha and Badshah). They have joined forces with Big Synergy to create Paan Parda Zarda. Dasgupta said, “The series brims with extraordinary, real characters, intense pride, devious deceit, violent retribution, but, above all, majestic love. Paan Parda Zarda is a sensory overload that will leave audiences numb in its aftermath, much like a hit of the opiate that has been deployed to win wars and change fortunes in Asia for centuries. “With our current and prospective collaborations with A-List creators in Bollywood and regional markets, we’re all set to entertain viewers with top-notch content,” he said. Set against a fresh, unseen milieu, the series has all the elements of an epic tale that straddles human drama, organised crime, and political machinations. But, at its heart, it is a beautiful love story.